We’re pleased to announce the release of some exciting new features in Knowify Contractors, as well as some important changes in the way functional areas are grouped in the platform. Though it may take you a session or two to get used to the changes, we are confident that they will improve your experience. The Estimates and Contracts section has been merged into Jobs. From now on, you’ll be able to manage your jobs and their related contracts or service agreements from the Jobs section, which will reduce some redundancies and simplify the navigation. Now the allocations you create in your project plans will automatically push to your Resource Scheduler when those project plans “Go Live”. We have added a ‘Foreman’s View’ to Time Tracker. This view will make it much easier for a foreman (or similar person) to fill out timecards for all the tradesman on a particular job on a given day. 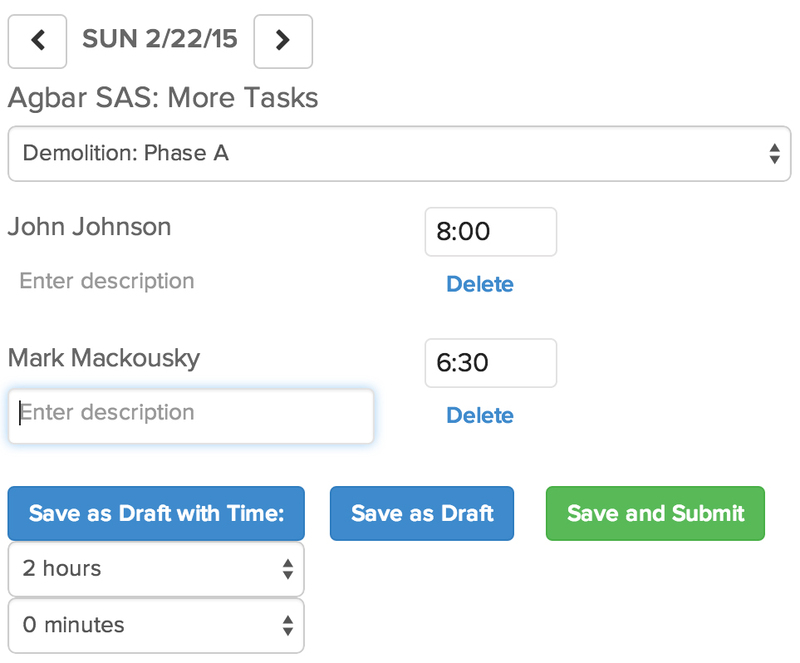 This feature is powered by the Resource Scheduler: it will only display time cards for tradesman scheduled to be on the job on a particular day. We have created a new feature based on the feedback received from the Knowify community: on-the-fly task management. You no longer will have to create whole project plans in order to have access to Knowify tasks; now you’ll be able to quickly create tasks on the fly for both client matters and internal projects, whether those matters/projects have project plans or not. 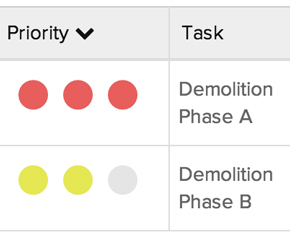 Further, we’ve added priority as a manageable value, as well as a new Task Report that will give you a snapshot on all the collaborative activity going on around your outstanding tasks. We look forward to hearing what you think about it! This field will enable you to identify the Estimator for whom a particular GC proposal is being prepared. The name entered in the Attn field will show on the proposal PDF. If you have questions about these changes, please do not hesitate to reach out at support@knowify.com. If you wish to, we’ll walk you through the changes and answer any questions you might have. Knowify aims to smoothe the contractor’s ride. Read the article here . Uptick in construction means bigger paperwork burden for subcontractors! Read how Knowify can help your business here . QuickBooks is excellent software for small business accounting. Hiking boots are great shoes. But just as you wouldn’t try to run a marathon in hiking boots – that’s not what they’re for! – you shouldn’t try to use QuickBooks to manage your day-to-day business processes… That’s not what it’s for! Now, before we get too far ahead of ourselves, there is a certain case for which QuickBooks alone would be fine as your core business management tool: if your business has very few employees, you have a background in accounting, and you don’t mind doing just about all the administrative tasks yourself. Needless to say, we think that most businesses would be much better off having both QuickBooks AND Knowify. To see why, consider the simple example provided by purchasing: in QuickBooks, purchase orders are entered by permissioned users as vendor bill previews. Note that there are no workflows, so the permissioned users can only be those folks in your company with unlimited purchasing authority – and that’s probably not a lot of people! Note also that QuickBooks wants to know which account to put the expenses in. If you’re uncomfortable with accounting, you might accidentally make a nice mess for your bookkeeper to clean up! Knowify, on the other hand, is designed to allow all of your employees to enter purchase orders – you can control their purchasing authority in setup, and then let Knowify’s simple approval workflows kick in if a purchase order they’ve entered exceeds their spending limit. Knowify also doesn’t ask for inputs that they might not be able to provide – like accounts -, and instead asks only for information that they will know: is it for a client, for a project, etc. To make sure that spending ends up accounted for correctly, Knowify gives bookkeepers and accountants a chance to set defaults and direct traffic via the “accountants view”. So, as you can see, Knowify puts the business process first, but without sacrificing the accounting step. There are many, many similar cases across the two platforms, and that’s still leaving aside all the features in Knowify (like project management or resource scheduler) that aren’t found in QuickBooks at all. Now, don’t get us wrong – we love QuickBooks. It is without question the best small business accounting package available… That’s why we chose to sync Knowify with QuickBooks – we know that businesses need to account for things. And indeed we believe that Knowify has one of the tightest integrations with QuickBooks available today. We push and pull near real-time updates to invoices, bills, clients, and vendors, ensuring that your actions in one platform are quickly reflected in the other. We also push Knowify timecards to QuickBooks, allowing you to take advantage of Knowify’s very powerful features involving time (like project management, time approval, and contract-specific billing rates) while retaining the payroll functionality you’ve come to rely on in QuickBooks. Add Knowify to your business today, and find out what the combined power of QuickBooks and Knowify can do for you! Think about all the time lost – small amounts every day, larger amounts once or twice a month – from little inefficiencies in your business processes. These are things like handing off POs to be signed, figuring out the purchasing history behind an invoice, or figuring out when you should schedule an important meeting. Then there are larger time sinks – looking way back through your file cabinets to see if you can find some old record that could be very helpful to some current job, or syncing up the team in the middle of a complex project, or matching billable time and purchases to contract terms. For a single person, these slippages probably cost them one or two hours a month. As you add more people, which virtually guarantees lower levels of visibility and higher business complexity, these slippages probably grow to five or ten hours per person per month. And that’s if nothing’s really going wrong! Using the latest data available (BLS Aug. 2014), US average hourly earnings are $24.53. That means that a twenty person company with a very modest 5 hours of business process “slippage” per person per month is losing $2453 per month to inefficiency! Ouch! If they were paying $119 / month for Knowify and Knowify lowered that number to 1 hour per person per month, you would save more than $1,840 per month! And that doesn’t even consider bookkeeping savings or the benefits to planning or growth that come from being better organized and more productive. One of our customers recently wrote to share that they’ve gone from a full time bookkeeper to one twice a month because Knowify has so improved their ability to translate their business processes to accounting, so their return on their monthly investment in Knowify must be very significant indeed. Affordable, easy-to-use 21st century business tools are available for your business. Give Knowify a try, and if in 30 days you don’t think the value proposition I’ve laid out above ultimately applies to your business, you can cancel without ever having paid a cent. Just remember: if you have 20 people in your company, every day you wait could be costing you $100! We’re very proud of the simplicity and ease-of-use we’ve achieved with Knowify. Though many business processes are by their nature quite complex, the reality is that that complexity doesn’t have to be the user’s problem. In short: we’ve tried to capture the complexity in our business process software so that you don’t have to worry about it on your end. Look at the diagram above – that’s a highly simplified overview of all the work Knowify does for you behind the scenes. That’s why Knowify is able to deliver the productivity benefits it does – because it seamlessly connects all of these business processes with only (very carefully thought out) minimal input from the user. Have you ever had to go back and re-read a contract to ensure you’re billing for your employees’ time correctly? Have you had to drop receipts or purchases orders into a filing cabinet to ensure that they get passed through the client – and, with luck, have the appropriate markup applied? Have you ever had a vendor’s invoice hit your desk and wondered: “What is this for? Who ordered this? Why are we spending so much money on [insert item]”? Knowify provides tools to handle all of these issues. Better yet, Knowify’s advanced project management module will bring all of your purchasing, contract, and time entry data together to give you visibility on the status and health of your projects, and will provide you and your employees with communication and collaboration tools to ensure that your projects get completed on-time and on-budget. 21st century business is competitive. Your competitors, especially larger ones, are embracing technology to get an edge. It’s time to level the playing field: try Knowify today. Let us know what business you are in to get started. Simply put, we believe that Knowify is the most powerful collection of business management tools available to small and medium sized businesses today. Knowify helps you manage all of your critical business processes, and ties them together in ways that make your life much easier. Never again have your bookkeeper ask you to check a contract for billing rates. Say good-bye to the days of the “mystery invoices” from your vendors. No more worrying about the status of a project or who-will-be-doing-what-when. Your business will finally have a chance to enjoy “big company” technology power, but in an easy-to-use, affordable package built from the ground up for small and medium businesses. Lastly, since we know that so many small and medium businesses use QuickBooks for accounting, we made sure that Knowify could integrate with your QuickBooks, if you would like it to do so. But unless you’re a sole proprietor with extensive accounting knowledge, running a business with accounting software is kind of like running a marathon in hiking boots – you can do it, but that’s not what they’re made for. Best, we think, to let accountants do accounting, and to let the “business” side of your business deal with tools that were designed to increase the productivity of your employees, improve your visibility as a manager, and help your business grow. You might think we’re exaggerating – but give Knowify a chance in your own business today, and we’re confident you’ll see the power Day 1. If you’re curious but not quite ready to give it a try, we’d love to answer any questions you might have. You can find us at support@knowify.com.